The work of Émile Gallé was what first attracted me to marquetry. Gallé (1846-1904) is best known as a designer of art glass. However, he also ran a furniture factory in the city of Nancy that specialized in marquetry. When learning marquetry I tried to emulate the floral designs that Gallé had popularized. Gallé’s business employed hundreds of people. There was production work that can still be found in auction houses and antiques stores. They also did some very fine “one off” furniture pieces. One of these unique pieces was a bed entitled Aube et Crépuscule (Dawn and Dusk). The headboard and footboard each feature symbolic marquetry insects spreading their wings over the whole width of the bed. The headboard depicts a moth-like creature hovering over a landscape with a setting sun. 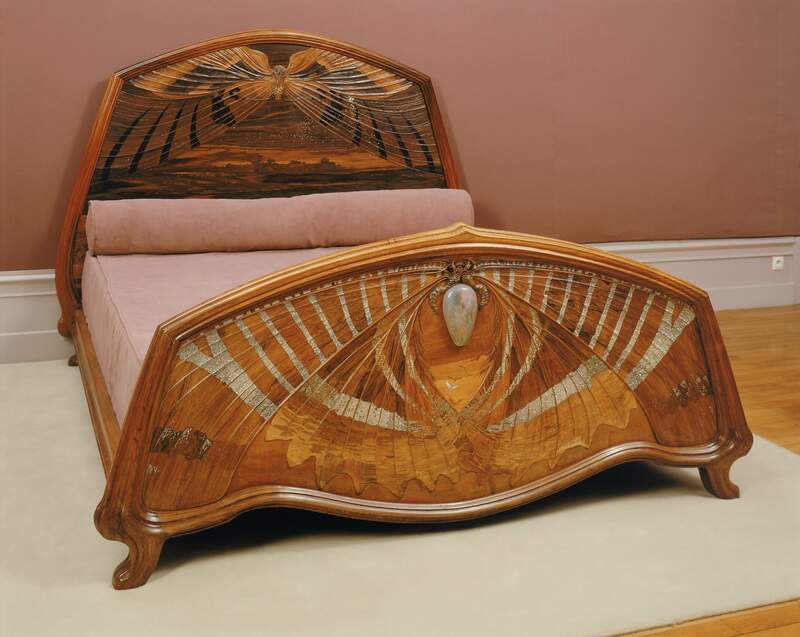 The footboard has another marquetry insect laid onto carved wood, simulating wings with ribs. The design uses bands of small pieces of mother-of-pearl to make the art glitter.